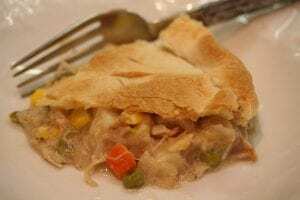 Save the Turkey Legs for Stock and Turkey Pot Pie! Yes, wild turkey legs can be very tough, but with a bit of finesse, the meat can become tender and delicious! Start by removing the legs and making a turkey leg stock. Remove the foot and pull the skin and feathers off the leg. Remove the leg at the joint by moving the leg away from the body and applying pressure until the joint pops. Use a knife to cut through and remove the leg. Depending on the size of the bird, you may need to separate the drumstick from the thigh by popping the joint and cutting at that point with a knife. Place the turkey legs in a stock pot with enough cold water to just cover them (at least 1 quart of water). Add a roughly chopped carrot, a roughly chopped stalk of celery, a few crushed garlic cloves, a bit of diced onion, and a handful of parley if you have it. Bring the mixture to a boil, add a dash of salt and pepper. Cover the pan and turn the temperature down so that the stock gently simmers. Simmer the turkey legs on the stove, tightly covered, for hours until they become tender. Stir every now and then and make sure the liquid does not boil off below at least 3 cups. This will take about 4 hours or can be done more quickly using a pressure cooker. When the meat is falling off the bone, strain the mixture, and save the turkey stock into a separate pan. 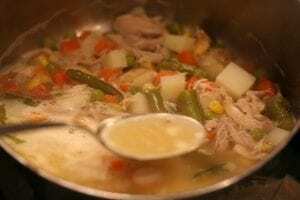 Use the stock for soup and other recipes, such as turkey pot pie. It will keep in the fridge for a few days and in the freezer for up to a year. The stock can be seasoned to taste with salt and pepper at this point or later when used in a recipe. When meat has cooled slightly, pull all of the meat off the bones and use the meat for turkey pot pie, sandwiches/salads, casseroles, or soup. In a saucepan or directly in an 8” cast iron skillet, add onion, potatoes, garlic, turkey broth, vegetables, poultry seasoning, and turkey. Bring to a gentle simmer and cook about 12-15 minutes until the potatoes and vegetables are tender. Place 2 Tbsp. 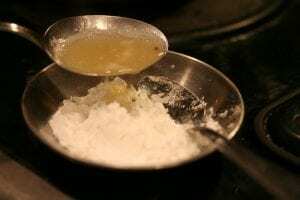 cornstarch in a small bowl, mix in 2 Tbsp. of turkey stock, and blend into a paste. Stir cornstarch paste back into the meat and vegetable mixture until well blended and add sweet vermouth (if desired). Bring mixture to a gentle boil and boil a few minutes until the sauce thickens a bit and add cream (if desired) and cook a minute or two more. If not thickening enough, add 1 more Tbsp. of cornstarch mixed into a paste with 1 Tbsp. of the broth (do not add cornstarch directly into pan as it may get clumpy). Add salt and pepper to taste and adjust seasonings. If not already in a cast iron pan, transfer the mixture into an 8” cast iron skillet. 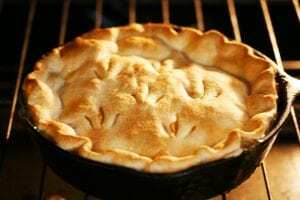 Place pie crust over the top of the pan and fold excess crust under around edge. Pinch the crust around the outside edge, sealing it to the pan so the sauce doesn’t ooze out during baking. Cut slits into the top of the crust to allow steam to escape. You can cut turkey prints for fun. Place pan in hot oven and cook for about 30 minutes until the crust is golden brown. 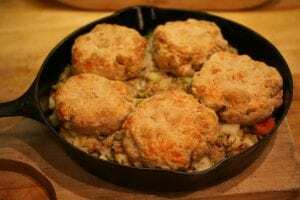 If using a biscuit topping, place uncooked biscuits on top of the turkey filling and bake 15-20 minutes or until the biscuits are golden brown.